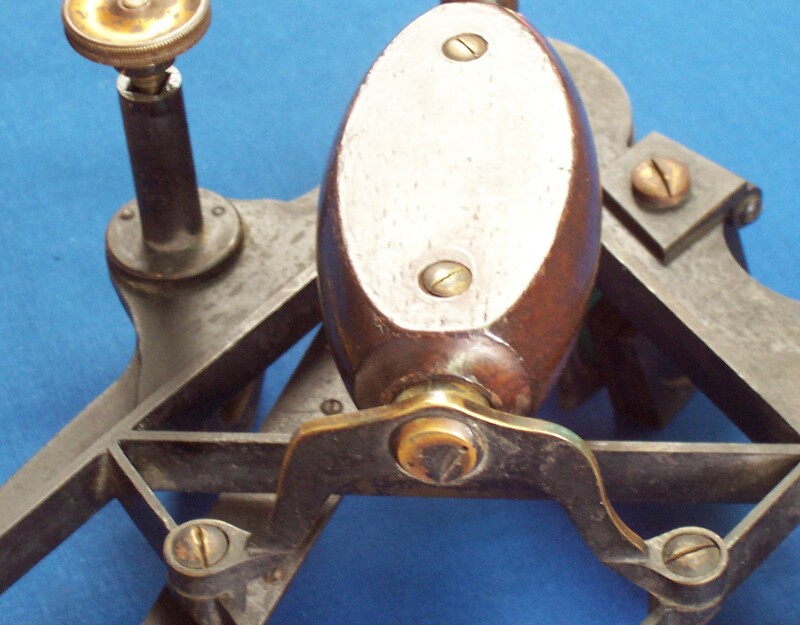 The preceding posts covers “A C19 Sextant Restoration” , “Making a Keystone Sextant Case” , “Restoring a C. Plath Drei Kreis Sextant” , “Heath Curve-bar sextant compared with Plath” and “A Drowned Husun Three Circle Sextant” . 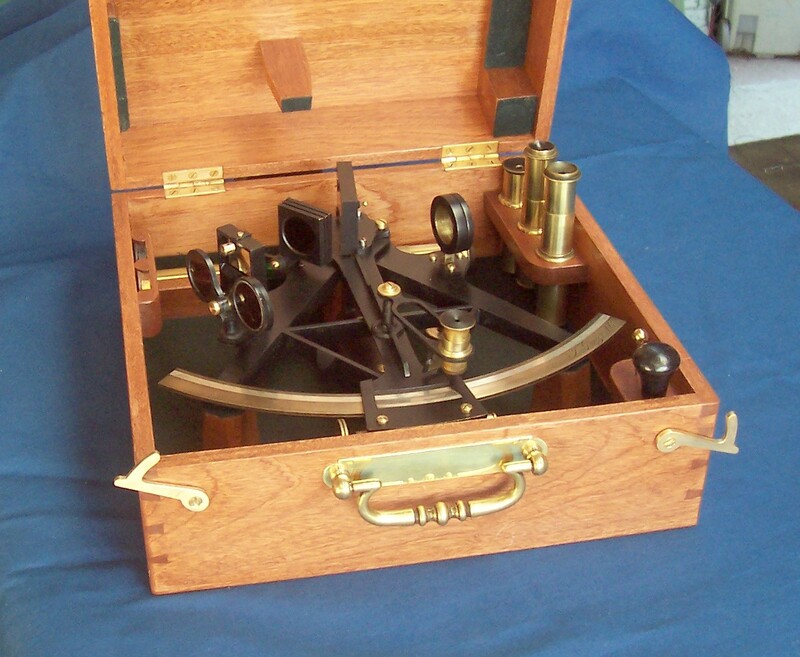 I recently acquired a Troughton and Simms sextant, with all its attachments, but without a case. I find I can sometimes afford such homeless sextants and, after having made ten cases, I can now make them so that they look reasonably in period. It was described in a later catalogue as a “Surveying Sextant, 7 ins., divided on silver and reading by vernier (with magnifier) to 10 secs. 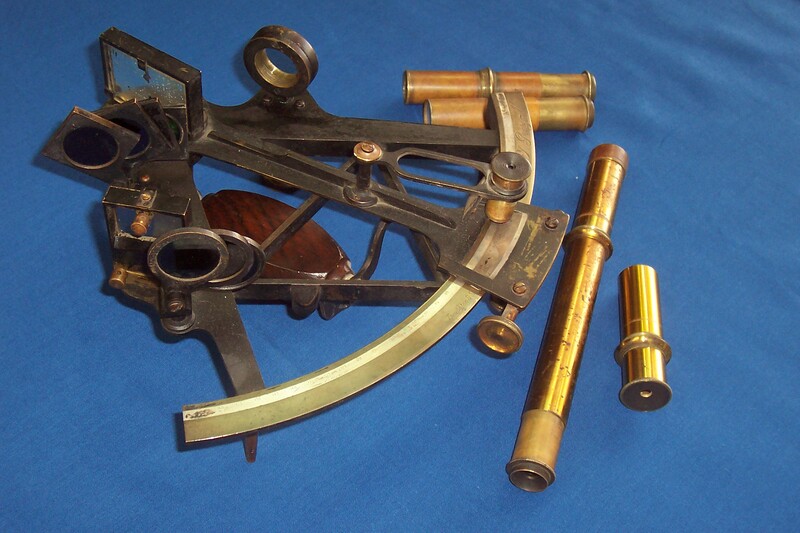 ..” In fact, it would also pass as a nautical sextant, as it is provided with the usual seven shades and kit of telescopes and sighting tube. 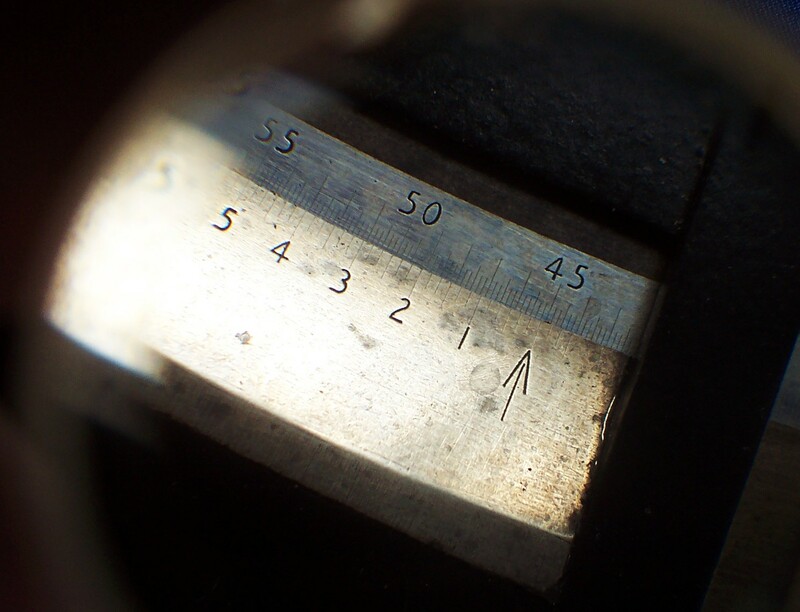 The inverting scope, provided with four wires in the eyepiece, is of 6 power with an effective aperture of 17.5 mm. The star telescopes are 2 power x 17 mm and 3 power x 15.5 mm. The latter may have belonged to another instrument, but both are in the same style.The Troughton brothers were active in London around about 1800. Edward Troughton (b.1765) carried on the business of instrument making after the death of his equally famous older brother, John, in 1788. By 1824, getting on in years, he took into partnership William Simms (b. 1793), describing him to an acquaintance as “the best craftsman he knew.” Troughton died in 1835 and Simms in 1860, but the business carried on as Troughton and Simms until 1916, when it became a Limited Company. It merged with T Cooke and Sons of York in 1922, to become the famous firm of instrument makers, Cooke, Troughton and Simms, with manufacturing being carried out in York, and offices and service centres in London and throughout the then British Empire. Thus, my sextant is unlikely to be later than 1916, but is otherwise rather difficult to date. There are features like the handle and the index mirror mounting that would place it in the nineteenth century, while the horizon mirror frame is possibly a twentieth century replacement. The cast bronze frame is perhaps a little old-fashioned, while the maker’s name on the limb is in an elegant script, typical of the nineteenth century rather than later stamped typeface. There is little information to be had about serial numbers of this maker. 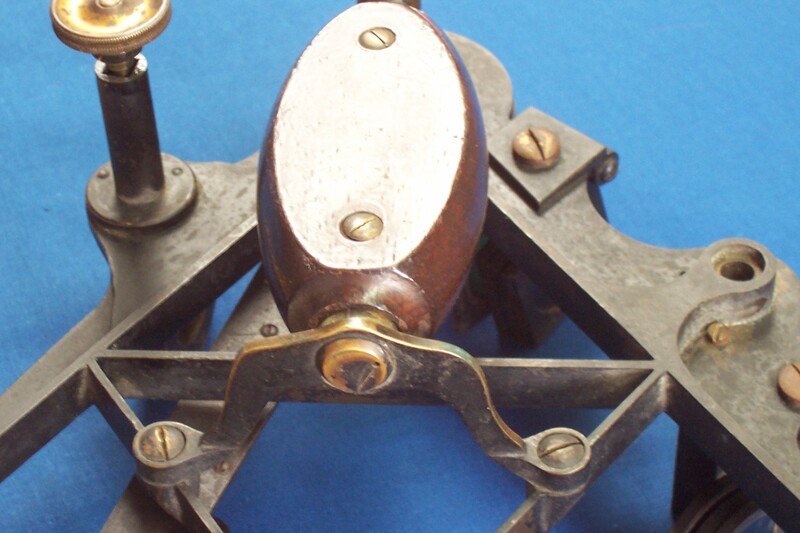 A sextant numbered 1920 is reliably dated to 1836 and if we take forty instruments a year as a reasonable estimate of number made, my sextant would find itself in the last quarter of the nineteenth century. 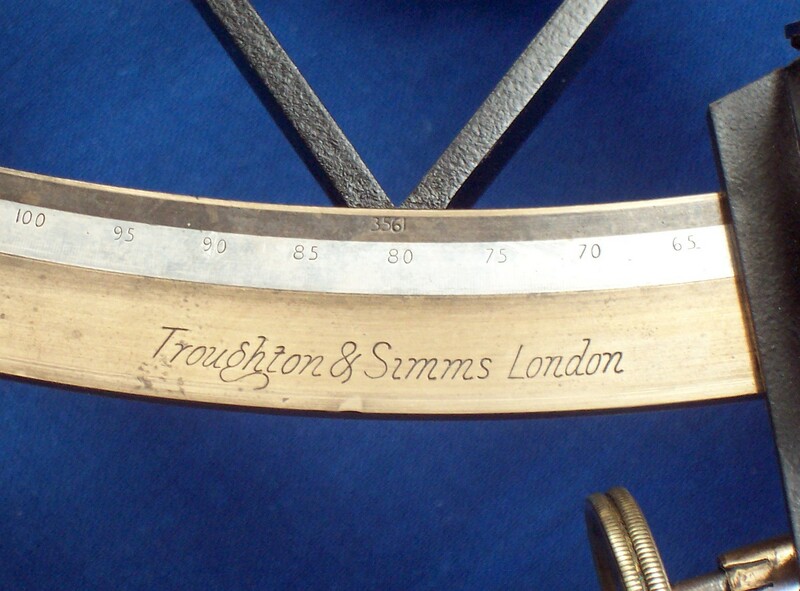 Troughton and Simms made very large numbers of surveying and other instruments during the expansion of the British Empire, and it is likely that sextants formed only a very small part of their output. The next picture shows it as I received it. Plainly, the rising piece had broken the fall of a dropped instrument. 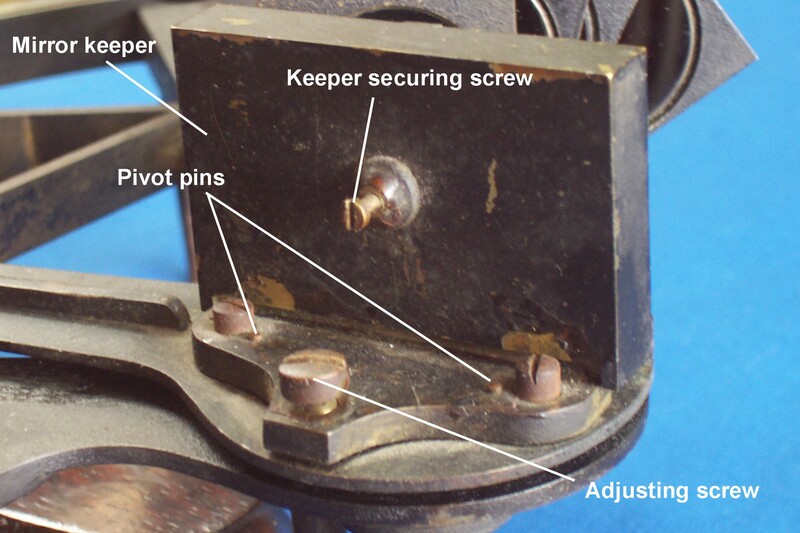 In the next photograph, which also shows the handle, it can be seen that the lead screw has punched off the end of the rising piece body. 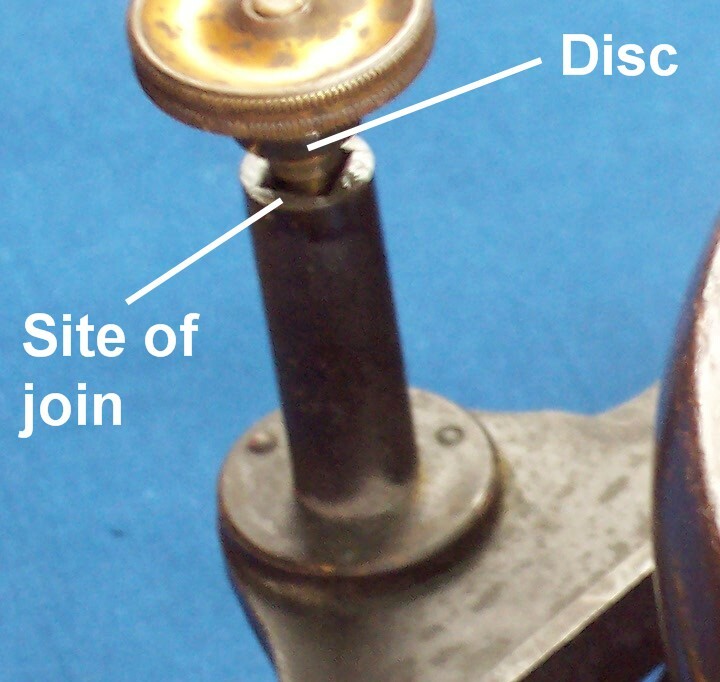 This normally appears to be solid with the body, but is in fact a disc of brass soldered on to the end of the body, as it would not otherwise be possible to form the square hole. The leadscrew is normally held captive in the body, the disc being sandwiched between a flange on the leadscrew and the thumb screw. 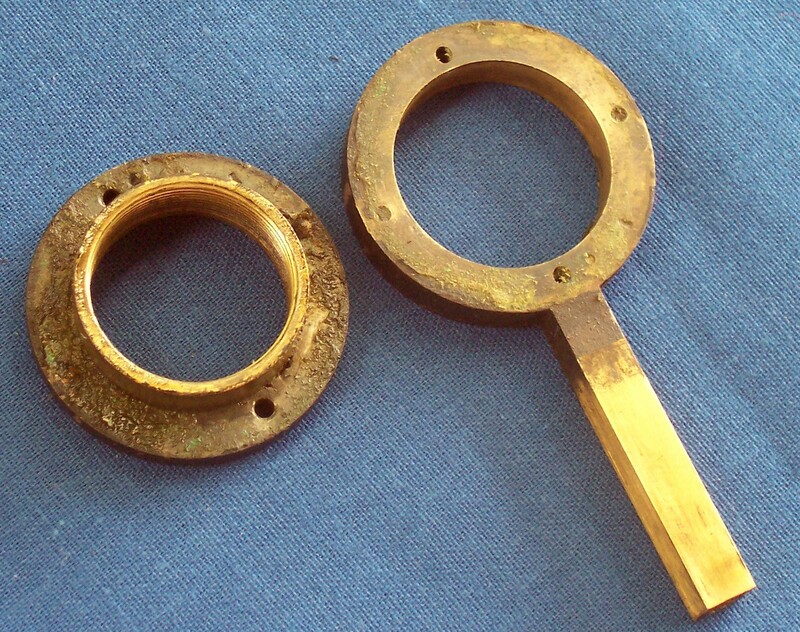 Once I had the rising piece out of the body and separated from the telescope ring, I could straighten it using a straight edge as a datum, so that it could once again slide smoothly up and down without any shake. 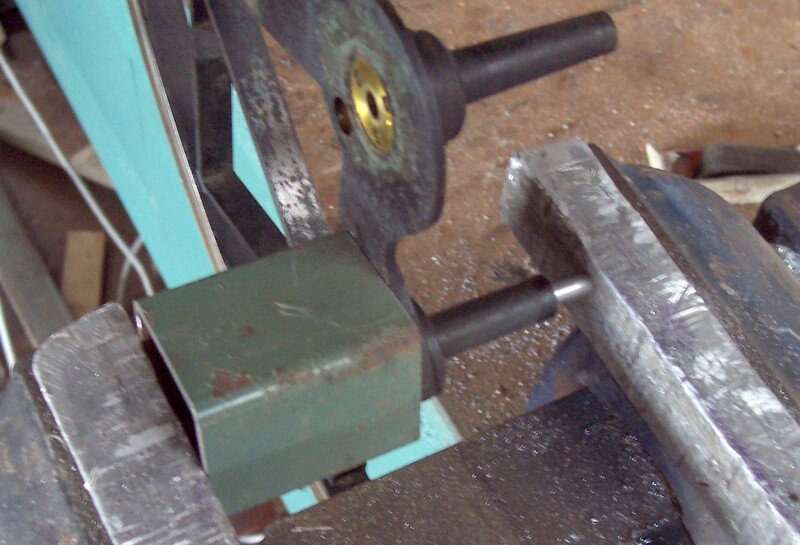 Note that there are two recesses machined into the stem of the rising piece for a pair of leaf springs. These I imagine were fitted to help reduce shake, but the mechanism functions perfectly well without them. The thumb screw had still to be parted from the leadscrew. This required only a well-fitting screwdriver and some brute force. I could then clean up the disc and resolder it to the body. The structure of the handle is practically unchanged from one from the 1820s. Note the tablet shaped wooden handle, the elegant lower bracket and the way the handle is attached to it with a pin screw. These screws, with two pin holes for a pin wrench were found aplenty in the Troughton Brothers’ famous pillar sextants of the late eigtheenth and early nineteenth century. 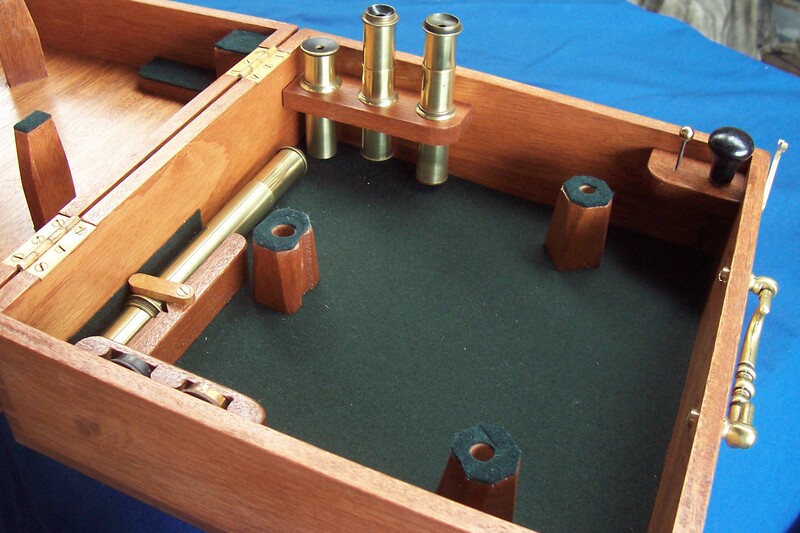 In these sextants, the frame was formed from two plates about 1.5 mm thick, held apart by about a dozen pillars, to which they were secured by pin screws. Imitating clock-making practice, this gives a relatively rigid and light-weight structure, but was very expensive to make. Finally, a picture to illustrate the archaic index mirror adjustment. 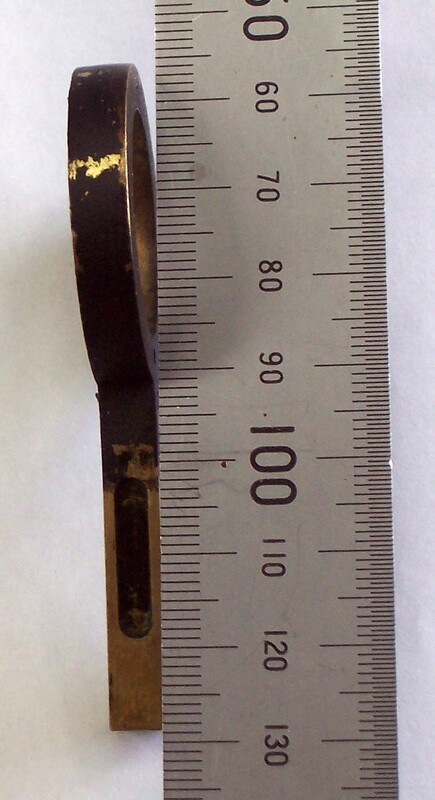 The mirror is held against an angle bracket by a keeper and screw. The bracket is held to the top end of the index arm by two screws and can pivot about two pins adjacent to the screws. A third, adjusting screw rocks the whole bracket. 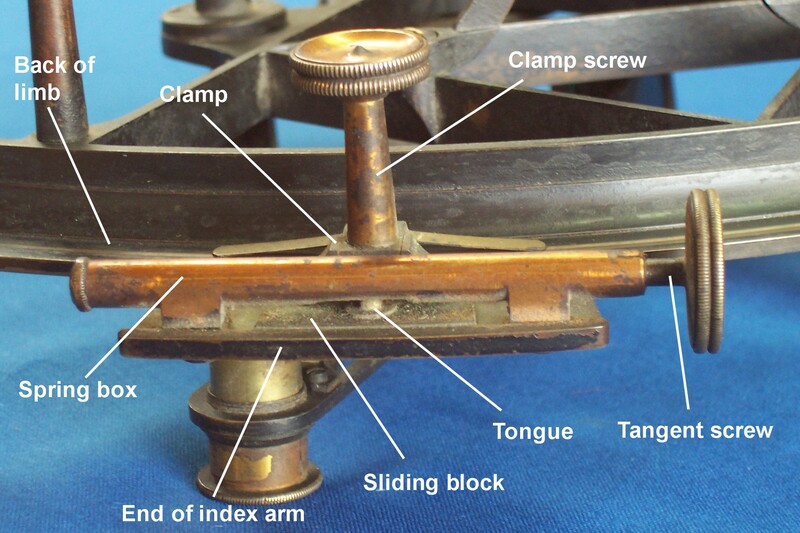 If you enjoy reading about details of fine instruments, you will enjoy my forthcoming book The Nautical Sextant. You will find some details about it in “About the Book.” Contact me via this site if you would like to be informed when the book goes on sale.